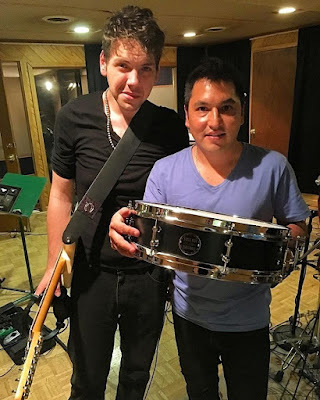 Andres Felipe Silva Gomez is at the forefront of drumming in South America, and he was recently back in Nashville. He had his 1.5 Steel--4 x 15 in full use for the first time at County Q studio for a session, and for a live performance at the CMA Music Festival. This is a drum he was introduced to by Mark Beckett (Grand Ole Opry, Nashville Sessions, Olivia Newton John), and is a drum that Mark is responsible for designing. Thank You Again Andres....Will look forward to keeping up on your musical work, staying in touch, keeping updated on that here in the Latest News, and elsewhere on this site!